Warlord wise, I have had great success with a jacked out Overlord joined to a large group of Warriors, Although he is expensive, he really helps the Warriors stay alive with his Orb and is amazing in Challenges, so I am going to continue with this choice for now. 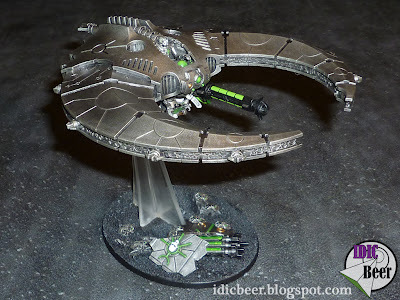 I will also use two Ghost Arks to 'Replace' his Warriors as they fall with their 'Repair Barge' ability. I still need to try out the Overlord in a Command Barge, but that will have to wait for another time. My old Pariah models are still standing in as Deathmarks until I get the proper models, but this time I want to try out a small group of five. I know they won't kill much this way, but I think they will make a nice cheap distraction unit. I will deploy the Wraiths up front with the Overlord and his Warriors behind them. The two Ghost Arks will follow behind them with their rear armour facing each other! (thanks Mercer for the heads up on that one). The two Annihilation Barges with support from the best positions they can find and the whole group will push forward, with the Night Scythe and Deathmarks in reserve. Nice list, with no spamming. The list looks small, but I suppose that because there's lots of points in the vehicles and overlord. You seem set for First Blood, giving no easy first turn kills (all vehicles av13 apart from the flyer in reserve, and no small units, smallest being the 10 wounds in the wraiths). Obviously you can stay away from such combats, however an opponent may have a few of these combat units, and may not need a HQ character to win by a few and force a dodgy morale test. I would lose 2 warriors to get a cryptek of your choice (the warrior, cryptek and lord will still be 17 models, and therefore need 5 casualties for a morale test to start with). Thanks for the comment buddy, glad you liked the list. Actually, you are 100% correct in what you say about the Overlord unit. In my first game with this list (batrep coming soon) my Overlord unit was multi charged by some Blood Angel Vanguards and a small group of normal dudes, My Overlord killed some stupid cheap Sargent in a challenge and wasted his points, then I lost assault by a rediculous amount, only to fail leadership and run of the table! So good call on that one buddy. I will defo add a Cryptek to the unit. I also found that I really needed Whip Coils on all the Wraiths, three just wasn't enough. thanks for the pimpage, mate. I think your list looks a little light, but it's ok. I don't think you need that many Warriors in the Ghost Arks. If you keep Warriors within 6" of the Ghost Arks, then you can do multi regens; just remember these need to be done at the start of your turn. I would use the remaining points to bulk up the troops on foot to 20 and use remaining points to invest in more Wraiths. Wraiths are pure evil and you will find they will get dakka'd to bits with weight of fire power. I never used larger units of Warriors in 5th, but I have been pleased with how much damage ten Warriors and the Barge can do :D The list did start with twenty Warriors to do the whole regen thing, but I had to drop a few for other things. So if I drop the Barge Warriors down to units of five, that gives me 130 points. three Warriors extra for the larger group leaves me with 91 points left over. Enough for two Wraiths with coils. Would it be worth having two units, one with three and one with four? Or I could max out to one unit of six Wraiths and add in a Cryptek like Rathstar suggested, which I think is an excellent way forward. I've found a unit of Warriors inside a Ghost Ark to be fine. Combined together they can knock out 30 S4 gauss shots :). Personally I would go for two units of five Wraiths; but you cannot do this. I would max out a Wraith unit and have is stop about.